The major market averages were saved from sharp declines today, by the empire that Steve Jobs built. Stocks started the trading session deeply down, on reports of new and massive U.S. tariffs against China. The Dow Jones Industrial Average was down at one point by triple digits. Trading was choppy, with indices wavering between positive and negative territory. But then by mid-day, technology icon Apple (NSDQ: AAPL) did Wall Street a huge favor: it surpassed $1 trillion in market capitalization. Indices immediately turned around. The Nasdaq and S&P 500 closed higher; the Dow finished slightly down. 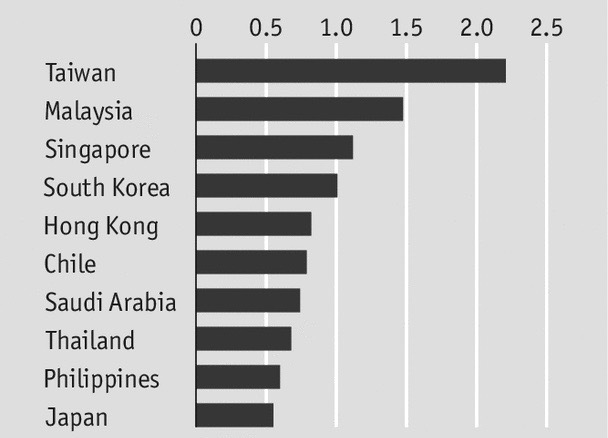 Export-dependent manufacturers led losses. 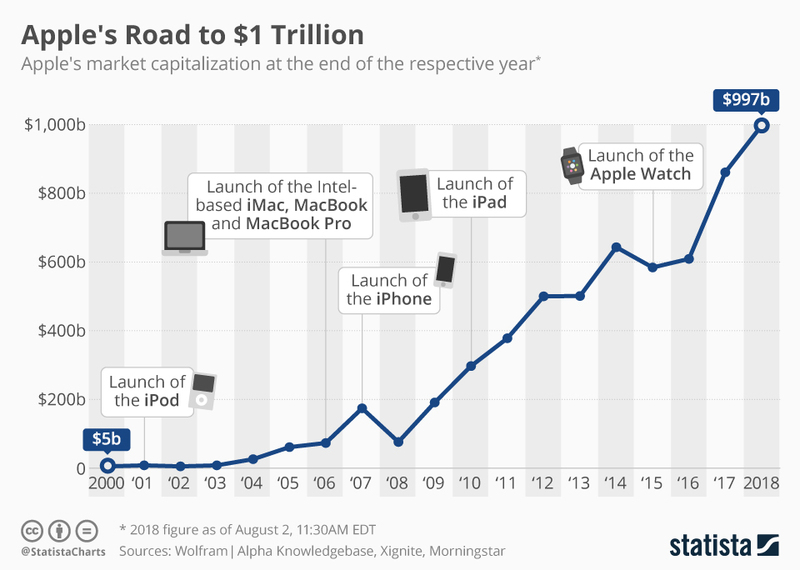 The splashy news today, breathlessly hyped on financial television, was Apple hitting its milestone. The press sure loves a round number. Apple shares today rose 2.92%, sparking a tech stock rally that lifted investor moods. The Nasdaq also was propelled by a 16.19% jump in shares of Tesla (NSDQ: TSLA). The electric car maker’s founder and CEO, Elon Musk, issued an apology for past inflammatory remarks and insisted that the company could eventually generate positive cash flow and turn a profit. As Apple’s persistent rise shows, FAANG stocks still benefit from expanding markets and strong balance sheets. But they’re also vulnerable to the escalating trade war, which kept today’s gains in check. Now’s a good time for a quick history lesson on tariffs, courtesy of Ben Stein. Stein is a conservative economist who served in the Nixon White House as a speechwriter and lawyer. He occasionally performs cameos in movies. The economic team in the White House would have benefited from attending Stein’s class. History shows that tariffs never work; they only make matters worse. China today urged the U.S. to abandon its protectionist policies, after the Trump administration vowed to impose a 25% tariff on $200 billion worth of Chinese imports, higher than its initially proposed tariff of 10%. The increased pressure from the White House this week is designed to wring trade concessions from the Chinese. U.S. Trade Representative Robert Lighthizer said Wednesday that Trump directed the tariff increase because China has refused to meet U.S. demands, which include buying more American-made products and giving up policies that favor Chinese companies. Chinese stocks fell Thursday. Year to date, the Shanghai Composite Index has slumped more than 16%, making it the world’s second-worst performing stock index. In the nativist worldview of Trump and his top advisors, China behaves unfairly on global trade. It’s true, China’s ascendancy has in large part stemmed from its willingness to wield sharp elbows with trading partners. Problem is, most economists are adamant that tariffs destroy economic growth and jobs. Tariffs cause unintended damage to other economies, not just the targeted ones. The emerging economies of Asia stand to become big losers in the U.S.-China trade war. Roughly 30% of the value of goods China exports to the U.S. is added elsewhere. As the trade war worsens, countries that are woven into Chinese supply chains will get hurt. Investors are confronting a new world order, as the Trump administration takes a sledgehammer to the existing rules-based multilateral trade system. Proliferating tariffs are already exerting an economic domino effect around the globe that could translate into a stock market crash. The slump could start in Asian stock markets and spread like contagion; we’ve seen this dynamic before. To be sure, economic fundamentals are strong enough to sustain the bull market for the rest of 2018. Today, the Labor Department reported that initial claims for state unemployment benefits increased 1,000 to a seasonally adjusted 218,000 for the week ended July 28. That’s less than the 220,000 expected by economists, a sign that the labor market remains healthy. However, unless the trade conflict abates, investors will remain off balance and susceptible to panic selling, regardless of Apple’s welcomed but largely symbolic achievement today. Apparel maker beats on earnings. Wood products provider posts profit after year-ago loss. Digital ad agency’s strong earnings fuel turnaround hopes. Health care staffing firm misses on earnings and revenue. Restaurant chain posts weak operating results. Analysts downgrade online travel agency. “What does America’s abandonment of the Trans-Pacific Partnership mean for China and Asia?” — Harold K.
The U.S. exit from TPP strengthens the bargaining positions of China and other Asian countries such as Japan and South Korea. These economically powerful countries are establishing their own trade arrangements and lending organizations in the region to supplant those of the West, leaving the U.S. isolated.